The duo had contested the last Lok Sabha elections from Amethi, a contest won by the Congress chief, and are likely to lock horns once again in the upcoming general election. 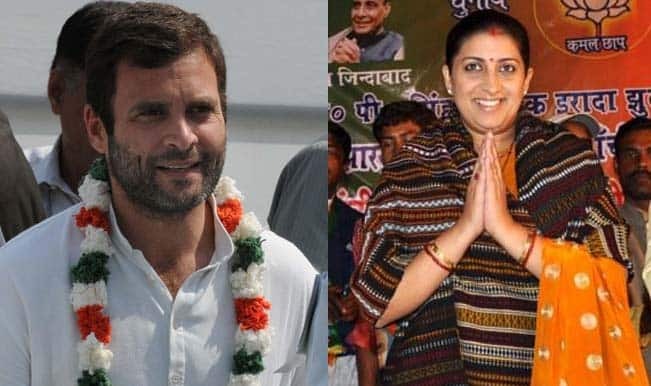 New Delhi: Uttar Pradesh’s Amethi is set to turn into an arena on Friday as Congress president Rahul Gandhi and Union Minister Smriti Irani visit the political hotbed on Friday – almost five years after they locked horns in the Gandhi bastion during the 2014 Lok Sabha polls. While Rahul will be in Amethi on January 4 and 5, Irani, a vocal critic of the Gandhi scion, will begin her daylong visit to the Gandhi bastion on Friday. The Congress chief will meet the people of his constituency, attend public and party reception, hold ‘corner meetings’ in Salon and visit Pareshdepur, Naseerabad, Paraiya Namaksar and Gauriganj areas on Friday. Irani, on the other hand, will attend a programme organised by Raghav Sewa Sansthan during which blankets and financial assistance will be extended to needy people and a foundation stone for a school will also be laid. Irani continued to cultivate Amethi during these years, dropping enough hints that she will once again contest against Rahul Gandhi in the polls.